We love to find beautiful items that are useful too! The SEI Contemporary Espresso Storage Bench doesn't dissapoint! It is a striking bench that has a generous hidden storage space. 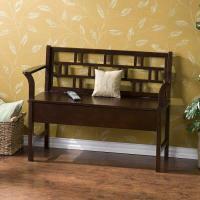 A customer favorite, this espresso finished bench will make a wonderful addition for your entryway, bedroom or kitchen. The seat of this bench lifts to reveal a spacious section that is perfect for storing all of those items that add clutter to your space. Store your media equipment, blankets, gloves or crafts all in this bench for easy access. For more details visit www.cheapchicdecor.com.